Sherway Area Study – Final Staff Report presents the key findings and requests City Council direction to develop an updated planning policy and development framework for the area, in the form of a Secondary Plan. To obtain copies of the Final Study Documents including Urban Design and Streetscape Guidelines; Community Services and Facilities Report; Transportation Master Plan and Appendices; and the Servicing Master Plan, please email Carla Schreiber or phone 416-394-2607. 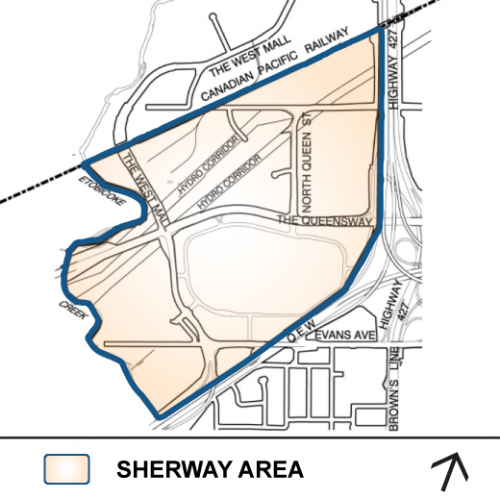 The boundaries of the Sherway Study Area are Highway 427 to the east, the CP rail corridor to the north, the Etobicoke Creek and municipal boundary to the west, and the Queen Elizabeth Way (QEW) and Evans Avenue to the south. The Sherway Area encompasses approximately 200 hectares and is characterized by retail and commercial uses that include the Sherway Gardens shopping centre. The area also contains institutional, office and employment uses (i.e. Trillium Health Care Centre, the office buildings at 701 and 703 Evans Avenue, industrial uses south of the CP rail corridor) and residential uses on Evans Avenue. The western boundary of the Study Area includes extensive natural areas associated with the Etobicoke Creek valley and open space system.